How often do you intentionally check out? What if we planned our lives the way we plan our vacations? This past week my family “checked out” of the hustle and bustle for a vacation to the mountains. When you kick your mind out of gear, you are able to reset, refocus, and recharge. I guess you can say is it rebooting our internal computer. Our agenda consisted of eating great good, fishing, river yoga, and tubing along the river. After about 24 hours, I felt my mind starting to relax and take in the new scenery. 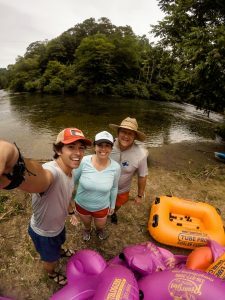 While I stood in the river with my son’s GoPro filming his fishing progress, I once again realized “we don’t do this enough!” At that very moment, I stopped myself and made the decision to enjoy every second of activity and conversation instead of questioning why I don’t do this more often. One of our activities planned was tubing on the river. As we packed our cooler for the trip, we made the decision to leave our phones in the car. Our son had his GoPro for pictures so we were set for our 3 hour trip. As a mom, we always want more moments like this with our family. I had their undivided attention for at least 3 hours with no phones. It was amazing what happened as we unplugged from the world and embraced the moment. We engaged in conversation, commented on the beauty around us and laughed a lot. After coming off the river, we visited a local bakery with the best cinnamon rolls and coffee. Did I mention the weather was cooler than normal and we were frozen when we emerged from the tubing trip? The warm rolls and hot coffee filled my soul as we talked about our trip down the river. What are you planning right now? So many wonderful moments result from the plans you make with your family. Enjoy the dreaming and planning process. Oh, the joy that fills your soul . . . just like cinnamon rolls and coffee.